Today, we’re meeting Belle Manjong, an attorney-turned-wedding professional. Belle offers wedding planning and floral design services and also owns a retail bridal boutique in downtown Charleston, West Virginia. I began in the industry as an event planner. As an associate at a large corporate law firm that stressed community service and engagement, I sat on a number of boards of non-profit organizations. I found myself gravitating toward fundraising events, particularly the formal galas. With the assistance of committee members, the first gala chaired was the most successful in the fifty plus years of the organization and very well received. In fact, I has hired for my first wedding event at that gala. After years of moonlighting, I left the legal profession to in order to fully commit myself to event planning which I found far more fulfilling. Seven years ago, we added a floral department and five years ago, added an experiential bridal boutique. The industry has far may more options. As far as innovations, it is constantly changing with new, fresher, more exciting ideas and production. However, the saturation of the market and lack of need of accreditation of any sort means the prevalence of fly-by-night operations is even greater. I feel that with each passing year, there are new layers and ideas brides and grooms can incorporate into their special day: from invitations; wedding gowns, suits and tuxes; to food options; design and decor. There is always a new, interesting twist that can be brought to the table. You are only as good as your most recent event. This is not an industry in which one rests on their laurels — the envelope is constantly being pushed and one can always do better. Ideas are plentiful, mastery and execution make all the difference. It’s an industry of love and people: if one does it only because they think its fun and can make lots of money without recognition of the human element, the humanity, one will surely fail or be miserable working in the industry. 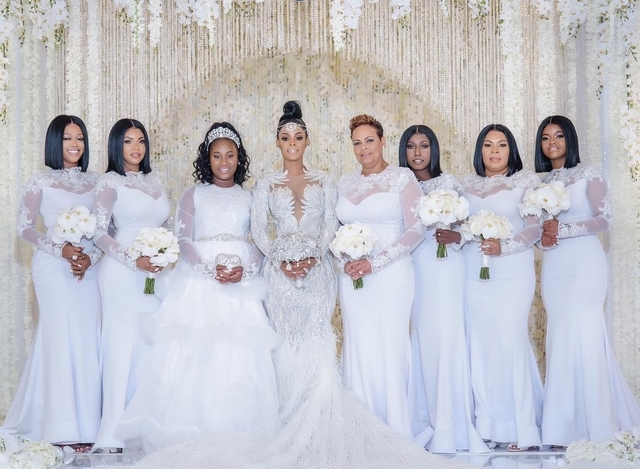 Keyshia Ka’oir’s bridal party in Christopher Paunil gowns from The Boutique by B.Belle Events. Only your clients truly matter — do great work, remain humble, and constantly push to do and better for your client — and if they are happy you will always be able to do what you love. People genuinely want to be helpful and they do so with referrals and become your ambassador. Also, being yourself and infusing yourself is everything — avoid copying — take great ideas and make them your own with your own twist. Success is slow and steady. You determine your personal success, and if you base it on the content of your bank account, you may never fully succeed in the conventional way that success is defined. For me, I have learned that what is most important is about being significant. Was I a significant force to my clients, to someone? Did I help someone realize a dream or vision in a way that they will always treasure it? Also, look over your shoulder, not to compete, but to better yourself. You are your most valuable asset, no one can be you or have your ideas. This week we’re meeting Nipunika Singh (left, pictured with Kripa Singh), founder of Élan Events by Nipunika, a luxury wedding planning and design firm based in Thailand and specializing in destination weddings. The destination wedding of actress Amrita Puri and Imrun Sethi. What started as a leisurely hobby turned into a full business! Always being an aesthete, I had a knack for dressing and decorating spaces. Friends and acquaintances were quick to notice this and many asked me to help stylize their family weddings. Soon after, clients began reaching out to me. When I realized how much I enjoyed designing decor it evolved into a full time profession and just like that, Élan Events was founded. At a wedding in Phuket, this custom mandap was covered with hundreds of tiny mirrors to reflect the sparkle of the sun and water. Expectations have increased as everyone's visions have widened. With social media, many wedding blogs, and Pinterest, everyone has access to more. This means all our clients request more variety and want to explore many options before settling for their wedding design. All our brides are also more particular about selecting something different for themselves in an interest stand apart. Bollywood singer Mika Singh entertaining wedding guests during cocktails. As a creative person, you instinctively want to give your imagination free reign. It becomes easy to get carried away when working on designs and you want to conveniently overlook that everyone always has a budget. As important as it is to be able to cater to what your clients want and more, it's also very important to be realistic with them and not overcommit or else you'll end up promising one thing and delivering another. I learnt this the hard way, but over the years I've become very clear and conscious of what we promise our couples so that each one can eventually say "we got so much more than we even expected." Sometimes your bride will have a completely different vision to yours. At first this would make me want to change theirs or go and meditate but now I've learnt that nothing is more important than giving your bride what she wants for her day. It's about guiding her and finding a way to marry her vision with your style. The minimalistic mandap design allowed the natural beauty of the island’s beaches to shine. There is a fine line between being accommodating and being pushed over. Planning and designing a wedding is a very personalized process involving many emotions and as important as it is to be sensitive towards your couples and their families, it is also important that they treat you with the same respect and level of trust. Don't compromise on your integrity, don't slash your prices to compete with others, and don't make promises you can't keep. Stay inspired, stay focused, stay positive!